A happy puppy knows his place in the world. This sense of security nurtures the development of its self-confidence. To a pup, security means: a warm, dry place to sleep, a full belly, adequate exercise, socialization... and knowing who’s the boss. As a new puppy owner, we all want to provide the little bundle of joy with the best that we can offer. It can be tempting to spoil the adorable little buggar rotten. If you do, chances are good of ending up with a monster on your hands - without even realizing what's happening until it's too late. As they say, too much of a good thing... isn’t. Over feeding, over treating, over stimulation, over tiring, over working, over babying... all need to be guarded against. "Unlike humans, there is no concept of "equality" in a dog’s mind. Either you will be the boss, or he will." Puppies, like children, need a sense of structure in their world. Establishing a regular daily routine, setting rules and limits, fair and swift discipline - when necessary are all important. But establishing your position as leader of the pack is perhaps the most so. All dogs are naturally "pack" animals. As is the case with wolves, coyotes - or any other wild dogs - there is a social structure within the pack. 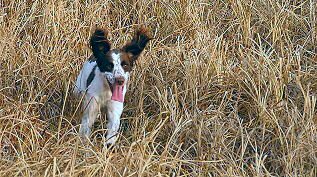 Among any group of dogs, you’ll find one that stands out as the dominant animal - be it male or female. It may take a little time and patience to observe their behaviour within "the pack" before you can identify the "leader", but I can guarantee you, there will be one. Understand that a dog being dominant within the pack does not mean it has an aggression problem. It's just nature's way. Often, the pack leader’s posture expresses its leadership position. The head and tail are held high. Subservient pack members will approach the boss dog with their tail and head held at a lower level. There seems to be a ritual of sorts in paying their respects to the leader, from what I’ve observed. The dominate dog stands erect, seeming quite aloof, while the other dog licks the leader’s cheek and chin area - being cautious not to make direct eye contact. This type of behaviour begins when the pups are very young - even while still being nursed by their mother. It is fascinating to observe a litter of newborn puppies become a pack. Once the puppies are weaned and are no longer under their mother's care, one of the litter members will emerge as the "leader of the pack." It is rather similar to a game of "king of the hill"... lots of rough and tumble as challenges are made for the top position. Before long, however, it is sorted out and order is restored as they all come to understand and accept their role within the pack. If you have a dog, it is important that you claim "top dog" status. Doing so is a necessary part of the responsibility of dog ownership. Being the unquestionable leader will make the training process less frustrating - and life, in general, much easier. 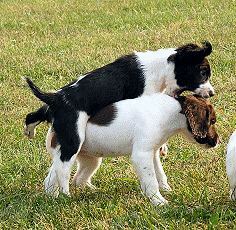 Lay claim to the "pack leader" position from the beginning of your relationship with the new pup or dog. Modeling your actions after the natural pack behaviours can help to establish this claim in a way - or language - that your dog will understand. If you do not make it clear that you are the "boss" while your pup is young, you could end up with a serious behaviour issue by the time he reaches maturity. I would dare to speculate that the vast majority of dogs in the care of humane or rescue organizations are there because their owners failed in their responsibility to be the dominant pack member. Whether your dog lives in the house with you or not, always resist the temptation to feed it scraps from your meal or share a snack while you are eating. In nature, the dominate pack member always eats first. You must, too. The rest of the pack respects this and knows that they cannot eat until - or unless - they are allowed to do so... after the leader is finished. They know their place. If you share your food with the dog, it will view this as showing weakness on your part and could invite a challenge to your authority. This applies to all members of the household. The pack leader controls the food and takes the best for himself. This can be carried over and reinforced when you feed him his dog food. Do this by insisting that the young dog remain hupped (sitting) until you release him to eat his meal. Likewise, hup him at the door whenever he is coming or going from the house. Be sure that you are the first to go through the doorway, then release him to follow. The leader is always first. In a way, being allowed to eat is a reward, in a dog’s mind. A treat can be used to reward "good" behaviour - anotherwords, the dog’s obedience to what you asked of it. However, the treat should be given only after he has complied - not as a motivator or as an attempt to bribe the dog into doing what you ask of it. Avoid giving treats without a reason. Always ask - and expect - something of the dog, first. This can be as simple as having the dog hup or enter it's kennel crate. Be cautious not to over do the treats. Otherwise, you will soon have a dog who doesn’t listen to you - one who doesn’t respect or accept that you are the top dog. Try to give deserved praise as a reward most of the time and reward him with a treat, less often. Everything belongs to the boss. This is one reason why when we train a dog using a ball or dummy, for instance, the dog is not allowed to keep it to play with, afterwards. Unlike humans, there is no concept of "equality" in a dog’s mind. Either you will be the boss, or he will. It’s as simple as that. If you tell the dog to do something and he does not comply, he is challenging your authority. Your reaction to this rebellion - whether you choose to enforce or ignore - will send a clear signal to the dog. If you do not insist on compliance, you will risk loosing your position of dominance. 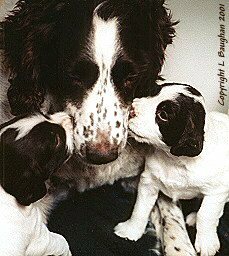 Loretta Baughan is the Founder, Editor and Publisher of Spaniel Journal. 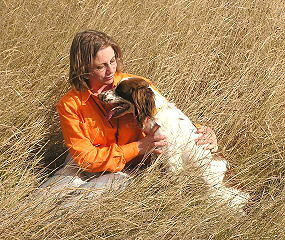 As owner of the Autumnskye kennel, she raises, trains and hunts her English springer spaniels. 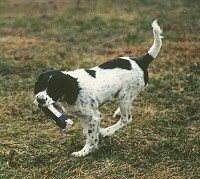 She is a member of the Northeast Wisconsin Spaniel Club. Loretta resides near Merrill, Wisconsin, with her husband, Steve, and their three children.